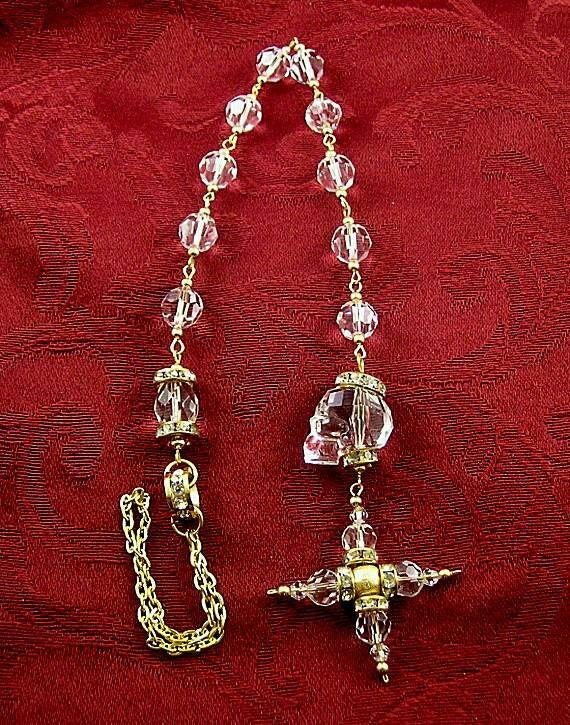 This stunning string of prayer beads consists of ten 10mm Swarovski crystal beads with a 19 x 18 x 14mm clear Swarovski crystal skull and a handmade crystal credo cross on one end. 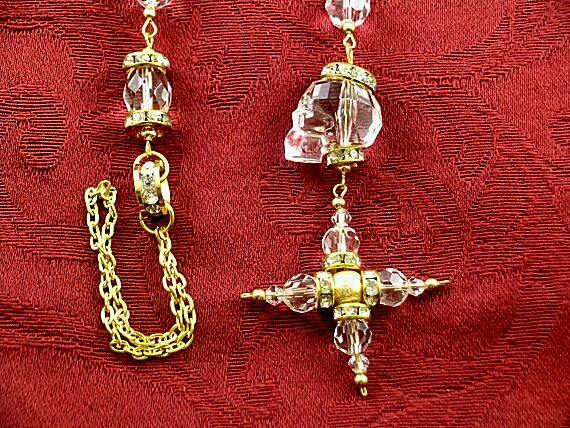 The other end has an embellished larger bead and a crystal/metal ring with a chain for hanging. The skull, large bead and cross are embellished with gold plated metal/crystal spacers which gives the appearance of a crown on the skull. Historically, skulls were popular on rosaries to "Remember Death" and that this life is only temporary. It hangs approx. 16" including the chain. Also available with black crystals listed separately. TENNERS - Tenners or Gebetskette Zehners (prayer chain with 10 beads) became popular in the 16th century. As the name implies, they were chaplets consisting of 10 beads. Sometimes another bead was added which was usually larger than the 10 beads and sometimes had bead caps and/or spacers separating it from the other beads. In addition to these beads there was a tassel, saint's metal, credo cross, crucifix or some kind of pendant. Often a number of these items were used in combination at the end of the prayer beads.